If you suffer from back pain, you know how debilitating it can be. It keeps you from doing things during the day, and it often interferes with your sleep at night. Your body needs rest, especially if you’re recovering from an injury or surgery, but back pain tends to make it hard to get the rest you need. To restore that balance, try these strategies to ease pain and calm your mind for a better night’s sleep. This doesn’t mean you sleep better by napping, although a power nap can be a good thing for some people. It means that you have a much better chance of sleeping well when you take care of your back during the daytime. You shouldn’t avoid activity entirely, but it’s important to be careful about the types of activities you do. Everyday chores around the home, like cleaning, mowing, and landscaping, can be especially hard on your back. If you don’t have someone who can help, consider hiring outside help on occasion. It won’t cost much and will save you discomfort. For example, most homeowners in Louisville only spend an average of $119 - $231 to have the interior of their home cleaned. Besides getting help with those everyday tasks, stop and think twice before taking on bigger projects or overdoing it with exercise. You don’t want to risk putting a strain on your back that will keep you up at night. While avoiding activities that worsen back pain, focus your energy on how you can ease pain throughout the day. Can you do light exercise like yoga or Tai Chi? Have you tried massage therapy to relieve tension in back muscles? Or anti-inflammatory foods or supplements? These all natural ways to reduce pain can make a difference throughout the day and help you sleep better. For anyone who struggles with insomnia, one of the top tips for sleeping better is to calm your mind at night. If you worry about pain, the struggle of getting to sleep, or anything else that’s on your mind, start by finding a practice that helps you turn off that chatter in your head. The blog No Sleepless Nights recommends several relaxation techniques, such as guided meditation, progressive muscle relaxation, or deep breathing. Try a couple of these to see what works best for you. Besides getting worrying thoughts out of your head, relaxing your mind before bed also takes your focus off of pain. When you have back pain, you want to take relaxation a step further and also make sure muscles are relaxed before bed. One of the best ways to do this is by stretching to release the muscle tension that aggravates back pain. Try these stretches for your neck, shoulders, and lower back. For someone with back pain, the struggle isn’t just in getting to sleep but also staying asleep. Pain may wake you up, and even when something else wakes you up, pain can make it harder to get back to sleep. To start with, take a look at your sleeping position and whether it may be contributing to the problem. According to Prevention, the two best sleeping positions for people with back pain are (1.) 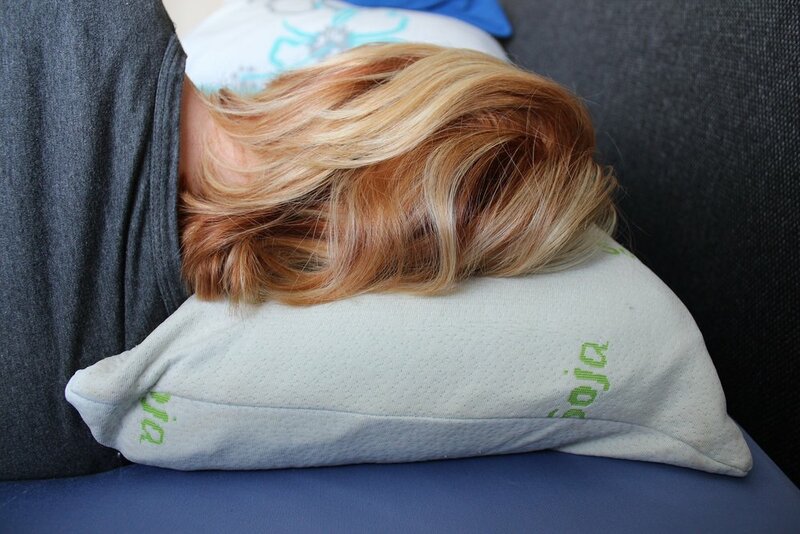 sleeping on your side with a pillow between your knees, or (2.) sleeping on your back with a pillow under your knees. Along with addressing your sleep position to reduce pain, consider whether other factors like light may be waking you up. If you have a digital device that lights up or dings, don’t bring it to bed! Besides the sound, the blue light from tech devices is especially disruptive to sleep. Don’t discount these little things that wake you up at night. Each of these may seem insignificant, but when combined they make a big difference. Even if these tips don’t eliminate back pain altogether, they can help you unwind and get the rest you need. This blog was guest written by Cheryl Conklin. I know, everyone is already sick and tired of talking about their resolutions for 2019. But listen, I am not here to discuss resolutions, I am here to provide three simple tips from our Medical Director, Dr. Thomas Huhn, that will help you lead a healthier and happier 2019. First, stop the bad habits. I realize it is not as easy as it sounds, but tell me this, is it easier to pick up training daily to conquer that marathon or easier to put down the obstacles that may be preventing you from achieving the health goal you set for 2019? In Dr. Huhn’s opinion, without cutting out smoking, daily alcohol consumption, or other bad habits, you may never have the energy or ability to tackle your health related goals. Second, get some sleep. Without proper rest and nutrition you will not have the energy or fuel your body needs to begin your exercise regimen. Beyond the energy benefits, getting a good night’s sleep also reduces stress, increases focus, and can decrease your predisposition for serious health conditions like diabetes and heart disease. According to Healthfinder.gov, getting a good night’s sleep can also help you avoid common sickness, keep you at a healthy weight, and increase your propensity to make good decisions. Finally, Dr. Huhn encourages patients to take smart steps to improve their dietary habits. Dr. Huhn states, “People tend to forget the vital part that food plays in their overall health. It’s really simple, if you put good things in, you get good things out, if you put bad things in . . .” well, you can guess the rest. Regular exercise is important but according to research, nutrition has the largest impact on our fitness. In the end, Dr. Huhn pushes patients to take baby steps at the start of the year to set the tone for the months ahead. If you are looking to make a change in your overall wellness in 2019, he encourages you to start by following these three simple steps. Have questions? Feel free to comment below. According to a recent study, the average wait time for a new patient appointment with a physician is 24 days. As you can imagine, if you are sitting at home in pain after twisting your knee playing in your church’s recreational league you are not pleased to find out it could be more than three weeks before you can get in to most doctor’s offices. Even worse, once you are able to be seen as a new patient, if you are referred for further diagnostic testing (x-ray, MRI etc.) it may take several more weeks before you are able to obtain these studies. Then again, you are forced back on the hamster wheel to wait for another doctor’s appointment and potential referral to a specialist. In the end, you have been subjected to weeks, potentially months of waiting in pain to find out what treatment options you have. At Aptiva Health, our entire structure is in opposition to the common referral pattern described above. At our facilities, we provide immediate appointments and strive to see new patients within 24 hours. We also offer diagnostic testing, physical therapy, in-office procedures, and specialist appointments all under one roof. You can literally twist your ankle today, call our office, be seen tomorrow, receive an x-ray the same day, an MRI the next day, and see an orthopedic surgeon the same week. By bringing all services under one roof we are able to better accommodate our patients and expedite their needed treatment and thereby, how quickly they recover from an injury. At the end of the day, we strive to set ourselves apart from ridiculous national average wait times and inconveniences. Our team of physicians, staff, and medical personnel are trained to provide immediate appointments to patients and work with patients to ensure they have the best experience while treating at our facilities. If you have any questions about what makes Aptiva Health different, call us to schedule an appointment today! When you get injured, there are two parts of recovering. One of the two parts of recovery is the physical, and then, there is the mental aspect of recovery. A lot of times, people forget they need to recover mentally from the ways their injury affected their mental state-- and that healing goes far beyond just physical. You have probably heard of a CT scan, CAT scan, MRI, and X-Ray, but in all likelihood you have no clue what the difference between them is. All these different types of imaging can be easily confused. What is the difference between them? To help clarify this, this is a beginners guide to understanding a CT Scan. Odds are you’ve heard of an MRI, but may not really understand how it works. An MRI is a commonly used diagnostic test in medicine. This is a beginner’s guide to understanding an MRI. It’s summer- the season for road trips, and there is nothing that will put a damper a trip like a car accident. Here are some safety trips to ensure a smooth ride. While massages are known to be a proven relaxation method, the benefits actually go beyond just relaxing. Betty Stengel, licensed Massage Therapist at Integrated Medical Solutions, answers all of your questions about deep tissue massage.